This is one of the biggest stone circles in the British Isles. It's 104 metres in diameter and of the 60 stones there are 27 still standing. There's a henge around the circle and also a few cairns. Read more about it here. This area is one of the most interesting ones in Europe. Follow the narrow road southwards, and you'll pass loads of Stone Age monuments : first there's a site that is still under excavation, then standing stones, Barnhouse village, Stones of Stenness and Maes Howe. 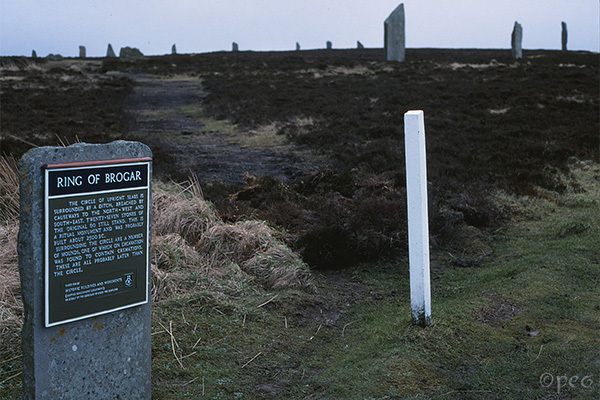 They are all on UNESCOs list of World Heritage Sites, along with Skara Brae, which is situated only 10 km away.